In my early days working at University of British Columbia (UBC) Press, I was tasked with maintaining the shelves used to house old and new UBC Press books. As I was shelving books one afternoon, I noticed large volumes of books, seemingly out of line with our more current collection, taking up valuable shelf space. They were bird books! What were these bird books doing back here? I wasn’t yet aware that UBC Press had a longstanding reputation for producing valuable and beautiful bird books. Birds of British Columbia (four volumes) in the 1990s and, a decade later, Birds of Ontario were classics in the field of ornithology. Add to these Birds of the Yukon Territory (2003), Birds of the World (2006), Owls of the United States and Canada (2007), The Inner Bird (2008) and Birds of Ontario: Volume 2 (2010). So what happened? Bird books, as important as they are, take a ton of time, money and resources to produce. According to Holly Keller, the head of our production department, one bird book, if done in the style of Birds of Ontario (that is, a larger format, full-colour photographs, etc. ), takes the time and resources of five regular UBC Press books to produce! After an eight-year hiatus from the bird scene, UBC Press is back with this year’s The Birds of Vancouver Island’s West Coast, by field ornithologist Adrian Dorst, and the almost-two-decades-in-the-making-project Birds of Nunavut. 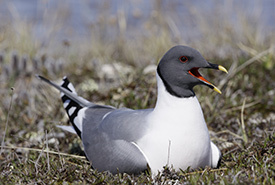 Birds of Nunavut is edited by James M. Richards, a naturalist and award-winning wildlife photographer, and Anthony J. Gaston, a senior research scientist with Environment Canada. 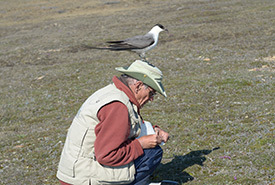 Along with a team of 16 academics, researchers and consultants, they conducted more than 300 seasons of field work in Nunavut, documenting 295 species of birds. This book — a massive tome by the usual UBC Press standards — is the result of their years of work documenting and photographing the birds of Nunavut. It’s a marked achievement by my friends at the Press, who have worked countless hours to present this important information in a clear and attractive way. 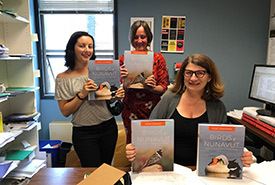 As with previous UBC Press bird books, Birds of Nunavut is an in-depth and affectionate look at bird species of a particular region. 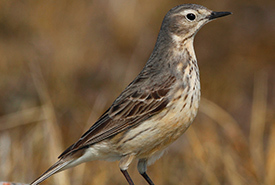 Birds of Nunavut includes an important discussion of the environmental dangers, such as climate change, that are steadily impacting the ecology and birds of Canada. In the book’s foreword, Jason Akearok, executive director of Nunavut Wildlife Management Board, tells us that “Birds of Nunavut provides a comprehensive snapshot of the current knowledge about Nunavut’s birds by which to calibrate future change.” If UBC Press can play a part, even a small one, in that future change, we’ve done our job. Megan Malashewsky is the agency and digital marketing coordinator at UBC Press. She holds, but is currently neglecting, masters degrees in library studies and archival studies from the University of British Columbia. In her spare time, Megan spends too much time indoors reading, watching sports and tending to her fiddle leaf fig, Sir Figgyback Newton. Read more about Megan Malashewsky .